Apartment Haus Goliath is located at Grunnibodenstrasse 27 3. Etage in Leukerbad in 474 m from the centre. 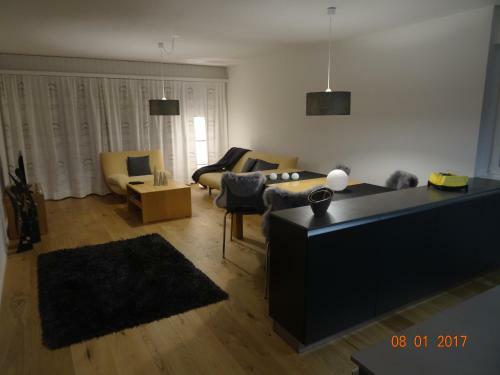 The apartment is in 59.8 km from the Bern-Belp Airport. Services provided to guests: special non-smoking rooms, ski storage, internet services, tennis court, well - groomed garden, car park, necessary equipment for watersports activities, alpine snowboarding, washing. Please consider you can pay for the amenities only in cash. Staff communicates in German, English, French. For guests, comfortable accommodation is offered only one room type - apartment. Every guest can use facilities such as hairdryer, kitchenette, refrigerator, microwave, flat-screen tv, electric kettle, coffee machine. This apartment has a seating area, dining area and toaster.